The new 2015 theme for WordPress has arrived. We’d like to introduce you to Twenty Fifteen. It’s that time of year again. The snow has started falling in northern countries, friends are gathering together to exchange presents, and it’s time to launch a beautiful new annual theme for WordPress. Hello World, Twenty Fifteen is here. Add your own custom header and you’ve got a stunning, personalized site. Handcrafted by designer Takashi Irie with incredible testing, support, and contributions from the many passionate people that make the WordPress community, Twenty Fifteen is now available for you and your readers. 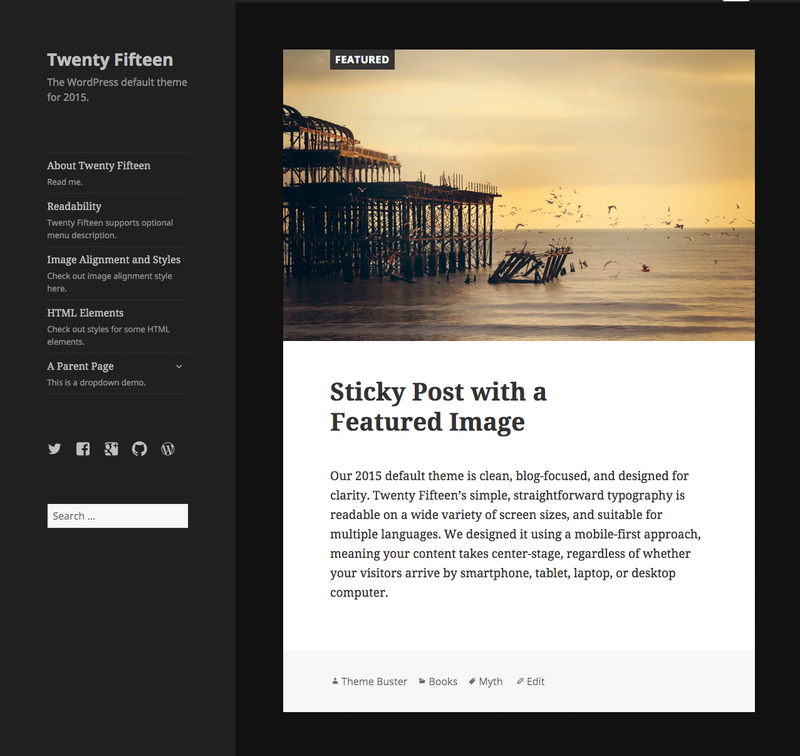 If you’re managing your own WordPress installation you’ll see Twenty Fifteen arrive as part of the new version of WordPress set to release later this month. Have a happy new year with Twenty Fifteen. I’m using the Yellow color scheme. Delicious. My favourite default theme in quite a while. Congrats to all involved! I’m very excited about this one 🙂 Can’t wait to try it! The free yellow background colour combination choice is too bright for some of us. Did we want eye strain? I’m about due for a facelift. This is certainly a contender. Great job! It looks great. I’ll definitely try this. Damn beautiful! I like the large fonts and I appreciate that the main nav menu and the sidebar are permanently visible on wide screens. It looks okay, and I’m starting to fiddle with it, but… there doesn’t appear to be a lot of out-of-the-box customization. It’s very bland. This is gorgeous! Can’t wait to try it! 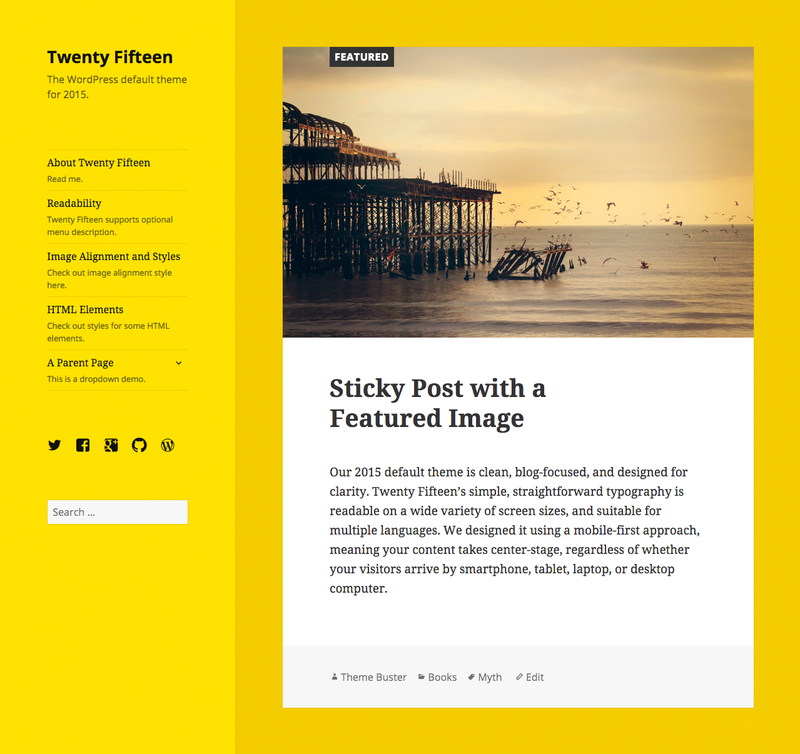 Just installed it on my blog – I’ve been waiting for a stock theme like this for ages. Very good. Like, Like, Like! I might have a play with this one. I currently am using Twenty Fourteen. How will Twenty Fifteen affect my older posts? 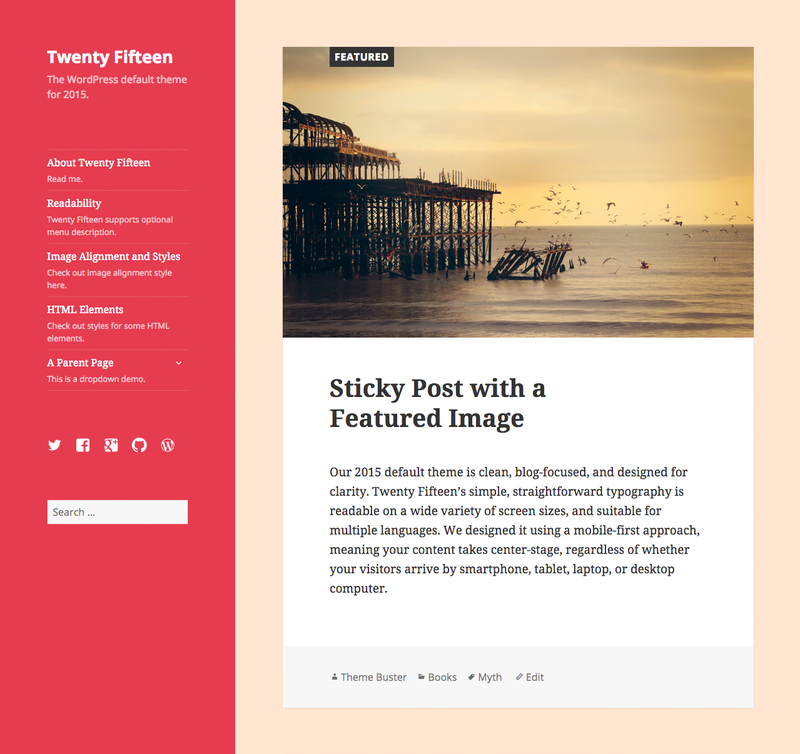 Your posts should simply look like they’re part of the Twenty Fifteen theme. But you can preview the theme before you switch if you want to check it out. If something doesn’t look right it might be a bug so just let us know about! Looks good! I like how the sidebar seems to scroll separately from the main section. It’s not [yet?] available in the WordPress.org repository, and there’s no download link. Looks very interesting! Think I might use it for a more personal blog. This is a very beautiful new Twenty Fifteen Theme with all the snow in the background. Thank you. That’s great! I will try it now. Looks good and has my attention. Will have to see how it would adapt to my busy site. Wow! Like the feature of ‘Menu Description’.since last few days Just thinking about and waiting for twenty fifteen theme as year 2015 is just few days away. Oh my goodness, this is stunning! I really think this theme is outstanding quality for the free default theme – very on-trend and functional. Thanks so much for your hard work and generosity, I’ll have a play! Nice but nothing so compelling to try it over my already elegant theme. Just visit my blog once and you will understand why. Looks simple … I want it. Just put it into action on my “Gallery – A Demo Blog” and love it! I especially appreciate that you’ve kept Attachment page navigation on Galleries, but there are a lot of subtle and elegant features to love. Here’s to a great 2015! Nice, clean layout – well done! Looks like a great theme. I like the fact that it works well in different languages. Try saying it five times fast! So just when I thought I had the blog looking just the way I want it, WordPress goes and announces ‘Twenty Fifteen’. I am a big fan of the default blogs as they don’t feel ‘basic’ compared to .org (which I am planning on switching to during Summer 2015). ‘Twenty Fifteen’ has a similar look to Editor and the fonts are large which I like. It doesn’t look quite as professional as ‘Editor’ though but I like that I can change the colours. Hopefully I will get more settled with the design soon and I can focus on content more than making the blog look pretty. What are you thoughts? Do you have a favourite design? I’ve started yesterday with my account and have some problems to get my domain connected, but I really like this one. It’s a beauty! The color schemes are pretty great. Nice theme. Is it ever possible to download theme from outside source? This theme will be included with WordPress 4.1 if you manage your own install. In fact, you can download the first release candidate for that version right now. The final version is scheduled to be available later this month. It will be available from the WordPress.org theme directory soon too. I hesitate to switch to it because it’ll be used on so so many sites, but it’s very nice indeed. Awesome new theme! I am definitely going to use it on my new wordpress.com blog! So excited! I helped a bit with Twenty Fifteen, my first code contributions to a default WordPress theme. I’m thrilled to see it launch. Like it a lot, good one! I’ve change for it. Sold! Planning to use it! Great work! stunning updation in the theme..
another fresh theme! good job WP team. At last, it has arrived! I’m liking all the custom goodies on this one! Still prefer Twenty Ten and wish you guys would bring Kubrick back. Yes — Twenty Fifteen is a free theme!